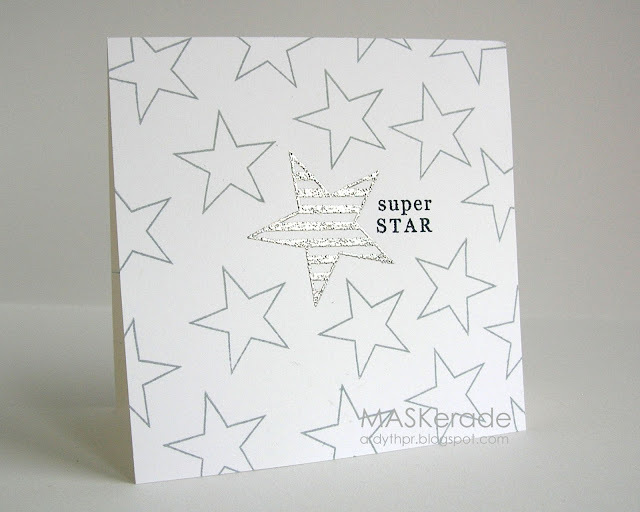 This week's One Layer Wednesday challenge is to make a card inspired by your favourite song, singer, composer, performer or something else musical. It can be "Happy Birthday" or a Christmas carol or a hymn, classical or country or jazz or blues or showtunes or whatever inspires you! 2. Make a card that is inspired by music in some way. 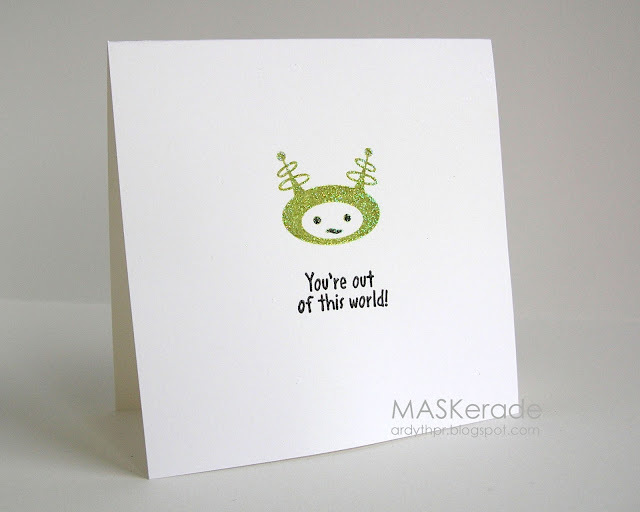 Remember to keep embellishments to a minimum and NO ADDITIONAL LAYERS of card stock. Oh my word, I love those monsters!! With your musical background and talent, I'll bet you had to restrain yourself from making even MORE adorable and dynamic cards, huh, Ardyth? I knew it! Musical, huh? Not my strong suit. Sugar. Music. Kraft. I'll see what drops out of the juke box in the bean. As I'm eating Halloween candy. Out of a kraft paper bag. Oh Ardyth, you are a girl after my own heart!!! DAVID BOWIEEEEEE We are away this weekend so I hope I have time to play on Monday. I am really going to have to think about this one .... so many 80's songs ...so little time. That is such a fun monster card, love it! All your cards rock Ardyth! Love your monster card,but I love the glittery spaceman and the glittery star? Oh my. Fabulous cards! I love that sparkly orange hair on the purple monster. I'm sure Bowie would be impressed! Your monsters are far too cute to be scary! Seriously, the purple guy actually is sportin' the David Bowie hair-do! The star card is simply "super". Love the black sentiment. Three wonderful CAS cards! 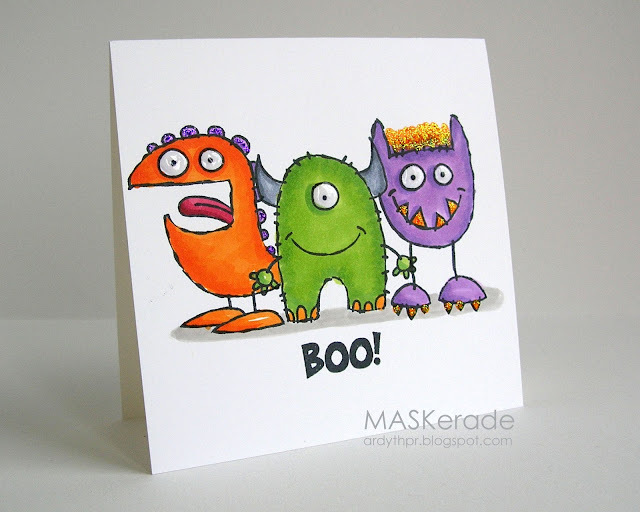 love your monsters - especially the one with the fuzzy yellow hair! Never mind the musical inspiration. Where do you get (and keep) all those stamps to go with the inspirations? I could never do a one layer card since I own only a few semtiment stamps - and plan to keep it that way. Loving the monster stamps. Whose are those? Great job. Subscribing in my reader. HAHAHA...those are the cutest monsters I've ever seen. What a fun card and your star card is very pretty. Adorable cards! What a fun challenge. I'll be uploading mine later today! I love your OLC monsters. Super cards and a fun challenge too! Must go off and have a think! Ack, love those monsters! I'm so intrigued by the last guy's orange/yellow hair, what is that?! Nice grounding on them too. Love the other two cards you made for this challenge too.